The Maryland Constitution of 1776 was the first of four constitutions under which the U.S. state of Maryland has been governed. 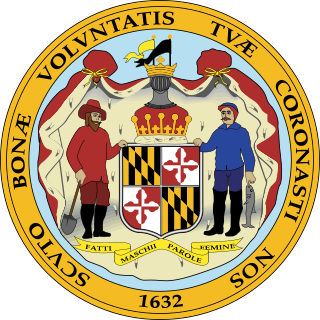 It was that state's basic law from its adoption in 1776 until the Maryland Constitution of 1851 took effect on July 4 of that year. Smaller caucuses might group Delegates by identity, such as the Women's Caucus,  notably the first women's legislative caucus founded in the United States. The Asian-American and Pacific Islander caucus,  or Legislative Black Caucus are other examples. Delegates may also organize by issue or area of experience, such as the Veterans' Caucus  . 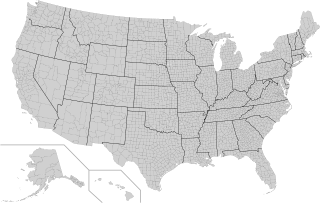 In addition, delegates from a certain county, smaller towns, or Baltimore City might organize its delegate delegation into a caucus-style group, such as the Baltimore City Delegation or the Western Maryland Delegation. David R. Brinkley is the Secretary of Budget and Management for the U.S. state of Maryland. He was appointed to the position by Governor Larry Hogan in 2015. Justin D. Ross is an American politician who served in the Maryland House of Delegates from 2003 to 2012. He was first elected to the House in 2002 to represent District 22, which covers Prince George's County. Steven R. Schuh was the County Executive of Anne Arundel County, Maryland, and a former member of the Maryland House of Delegates, serving two terms in the Maryland General Assembly representing District 31. Schuh was elected County Executive in 2014 after defeating incumbent Laura Neuman in the Republican primary and defeating former three-term Sheriff George Johnson in the General Election. He is the ninth Anne Arundel County Executive. He was defeated in his bid for re-election in 2018 by Steuart Pittman. Robert A. Costa was a member of the Maryland House of Delegates, and until his retirement represented District 33B, which is located in Anne Arundel County. He defeated Democrat Mike Shay in the 2006 election. In 2002 he defeated Democrat Dotty Chaney to initially capture the seat of this newly created district. He announced his retirement in 2014. He was succeeded by Sid Saab, real estate investor and the first member of the Maryland General Assembly to have been born in Lebanon. The Baltimore City Delegation refers to the 18 delegates who are elected from districts in Baltimore to serve in the Maryland House of Delegates in the United States. There are currently 6 legislative districts in Baltimore City with each having 3 delegates. The chairman of the delegation is chosen via an open ballot by the members of the delegation and usually serves for four years. The delegation usually meets weekly during the regular session of the Maryland General Assembly in the Baltimore City Delegation Room of the Lowe House Office Building in Annapolis. During the legislative interim, May through December, the delegation meets on an as needed basis. The Legislative Black Caucus of Maryland is an American political organization composed of African Americans elected to the Maryland General Assembly. Incorporated in 1970, the Caucus membership has grown from 17 to 44 and is one of the largest state legislative black caucuses in the country. Phillip D. Bissett, was a member of the Maryland House of Delegates, District 30 in Anne Arundel County and is a former Republican candidate for Anne Arundel County Executive. John W. E. Cluster Jr. is a member of the Maryland House of Delegates, representing the 8th district in Baltimore County. Victoria L. Schade was a Republican member of the Maryland House of Delegates, District 31 in Anne Arundel County. Martha S. Klima was first elected in 1982 to represent District 9, which covered a portion of Baltimore County, Maryland, USA. She unsuccessfully ran for the State Senate in 2002. She was defeated by Jim Brochin. Herbert H. McMillan is a Republican former member of the Maryland House of Delegates, representing District 30 in Anne Arundel County, MD from 2003 to 2007 and from 2011 to 2019. He served alongside Democrat Michael E. Busch and Republican Ron George. In 2006 he challenged District 30 Senator John Astle, a Democrat, who defeated him 53 percent to 47 percent. Kathy Szeliga is an American politician who has served as a Republican member of the Maryland House of Delegates since January 12, 2011 and as Minority Whip since 2013. Szeliga was the Republican nominee for the United States Senate in 2016 to replace Barbara Mikulski, who retired. Patrick Young Jr. is an American politician from Maryland. He currently represents District 44B in the Maryland House of Delegates and serves as the Chair of the Baltimore County House Delegation. Lesley Lopez is an American politician who was elected to the Maryland House of Delegates in the 2018 Maryland General Assembly election. With Kirill Reznik and Gabriel Acevero, she represents the 39th House District as a member of the Democratic Party. 1 2 3 Maryland State Archives (June 17, 2004). "Maryland House of Delegates – ORIGIN & FUNCTIONS" . Retrieved June 12, 2007. ↑ "Maryland General Assembly Caucuses - Women Legislators of Maryland". msa.maryland.gov. ↑ "Maryland General Assembly Caucuses - Maryland Legislative Asian-American & Pacific-Islander Caucus". msa.maryland.gov. ↑ "Maryland General Assembly Caucuses - Maryland Veterans Caucus". msa.maryland.gov. ↑ The Baltimore Sun (November 5, 2014). "Republicans ride GOP wave to gain General Assembly seats" . Retrieved November 5, 2014. ↑ "Anne Arundel delegate who came out as bisexual during conversion therapy debate changes parties". The Baltimore Sun. Retrieved October 15, 2018. ↑ "OUTGOING DELEGATE SWITCHES TO GREEN PARTY". The Montgomery County Sentinel. Retrieved November 21, 2018. ↑ Maryland Manual On-Line (March 3, 2017). "Maryland House of Delegates – Organizational Structure" . Retrieved April 19, 2017.